Ski-In/Ski-Out to the high-speed six-passenger Super Bee lift. 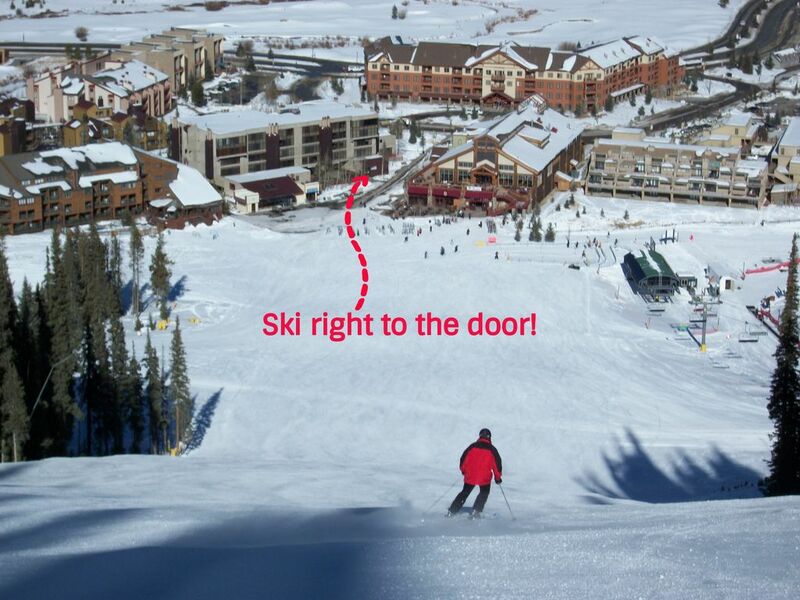 Be at the top of Copper in nine minutes! In fact, we are closer to the lift than the ticket windows. Kids get tired of skiing/riding? Then they'll love Copper's Tubing Hill! It is just outside the door and served by a magic carpet ride! Grandma coming to babysit? Our building is handicap-accessible and elevator-equipped, too. If you are a golfer, come on back in the summer, because you cannot get any closer to the first tee of the Copper Creek course! And watch for their golf season pass specials. Your pass can pay for itself in as little as a week! Want to be the next Shaun White? THEN THIS IS THE PLACE TO LEARN HOW SAFELY! Woodward at Copper is a year round ski and snowboard training camp dedicated to park and pipe progression. It provides a safe and fun learning environment for all levels of park and pipe riders and skiers through established progressive training techniques, and a state of the art 19,400 square foot indoor training facility to prepare you for the largest (22 foot) pipe in North America! We have been helping people save money on their Colorado ski and summer mountain vacations since 1975 by renting our mountain homes ourselves. We have many 'regulars' who have been enjoying the Summit County area for many years and they know we always offer a great deal and real homelike experience. We have made many friends over the years from the people who have stayed with us. We hope you will give us a try, too! We have been skiing the Colorado ski slopes together since 1974 and believe that Copper Mountain is the perfect ski mountain. It is a huge ski mountain with a smaller base area organized into 3 separate villages. We chose Snowflake in the East Village to be close to the high-speed Super Bee lift and thus be able to get to the top of the mountain in one 9 minute ride. Besides the quick ride to the top on the Superbee, we especially love being on the first tee of the Copper Creek golf course and our kids and their friends love being right at the tubing hill. Both baths have separate sink/vanity/mirror areas to maximize usability. Liquid hand soap and shower gel dispensers provided. Copper Mountain Resort Association provides free, on-call shuttle service, (Copper Coach) throughout the resort. Guests are encouraged to call them for pickup & return to Snowflake as needed. we're at the bottom of Rosi's Run (advanced) and Skid Road (intermediate). Superbee 6-passenger High Speed lift right outside our building. The tubing hill and Critterland kids snowplay area are also right outside the building. Hot water baseboard. Portable humidifier available. Private parking for one car (space 303). Spices, condiments, paper goods, dishwashing supplies provided. 74 channels in HD! 46' Samsung LED in the great room and a 32' Sony LCD in the Master Bedroom. Assorted DVD movies with plenty of Disney Movies for the kids. For rent at the Frisco Marina, 10 minutes away. Available for rent at the Frisco Marina, 10 minutes away. The 6 passenger high speed Super Bee chair lift is on the mountain side of our building. Also outside our building is Copper's tubing hill and Critterland, a winter snowplay area for the little ones. 1st tee of Copper Creek Golf Course outside our condo building. Best Ski Mountain in Colorado! Tubing Hill, Cross Country Ski Center, Sleigh Rides, Fitness Center with Spas and Massage, Factory Outlet Stores. Woodward at Copper is a year round ski and snowboard training camp dedicated park and pipe progression. It provides a safe and fun learning environment for all levels of park and pipe riders and skiers through established progressive training techniques, and a state of the art 19,400 square foot indoor training facility.